I used to never be a fan of chicken salad. I actually thought it was straight gross…It just always looked so heavy and mayonaisse-y to me and I could just imagine someone mass producing it in giant vats in some sort of gross cafeteria like kitchen, just chucking whatever random ingredients in. I guess my imagination just turned me off to the whole idea of chicken salad…so I disliked it before I even took a bite (not fair…I know). 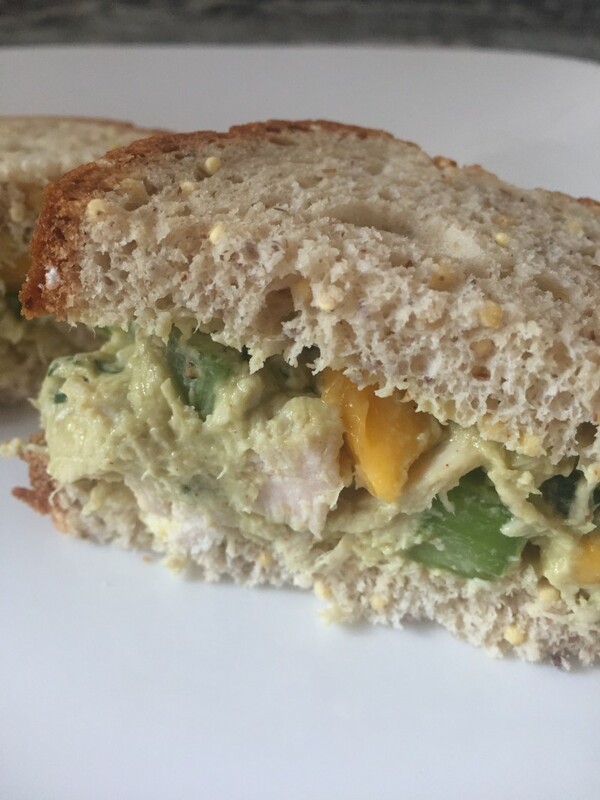 But I constantly see chicken salad sandwiches on instagram feeds and pinterest, people talking about how its so easy to make and how it can be both delicious and healthy. And healthy, easy, great tasting food is what I am into…so I thought I would give my own spin on it. 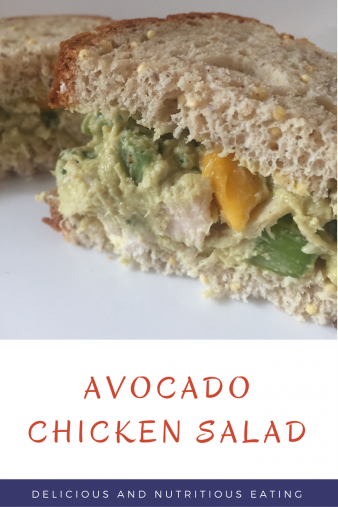 I used my favorite healthy seasonal ingredients, and my Avocado Chicken Salad was born! For a non-chicken salad lover I was pretty pleased. Before I go into my Avocado Chicken Salad Recipe, I just wanted to share with you a few great nutrition facts about avocado. Bottom line – Avocados are a delicious heart healthy ingredient that can help you feel full and may have more impact than just simply providing you with essential vitamins and minerals. And now for my Avocado Chicken Salad recipe. Basically you just take all the ingredients and mix them up in a bowl. The avocado along with the greek yogurt provides the creaminess of chicken salad without the use of mayonnaise. They also add an extra boost of nutrients like potassium, calcium, protein and fiber. 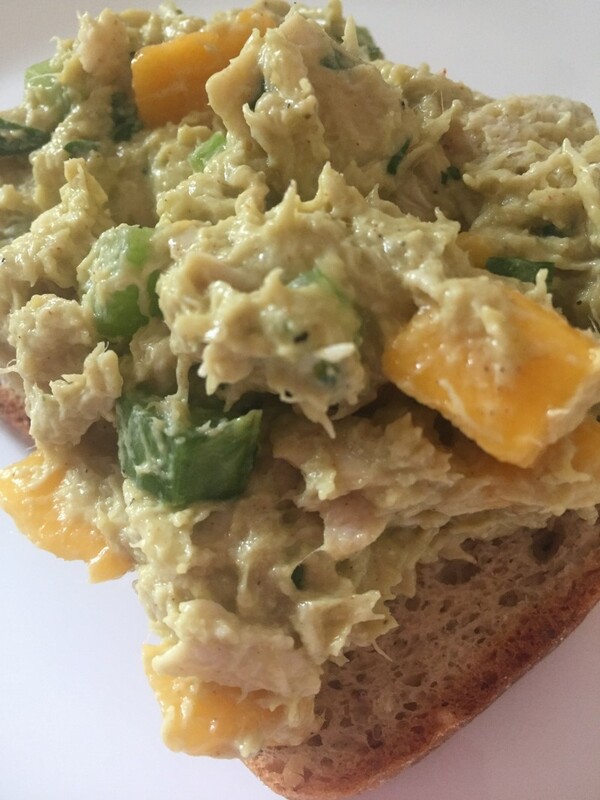 The celery adds some crunch, the mango adds some sweetness (and a few more nutrients 🙂 ), and other than the chicken, everything else is just added for flavor. Feel free to omit or add your favorite spices to make it your own. Oh and this would be a great recipe to use up any leftover chicken from dinner the night before. I love taking leftovers and turning them into a completely new meal. I hope you enjoy! If you try this recipe or any of my other recipes take a picture and post on instagram and/or facebook and tag me @delishnnutrish so I can see! Mash up the avocado flesh and mix with lime juice and greek yogurt in a mixing bowl until smooth. Stir in salt, cilantro, paprika, onion powder, and pepper. Add chicken, celery and mango to avocado mixture and stir until coated well. Refrigerate until ready to serve. Serve on a bed of lettuce or make into a sandwich with your favorite whole grain bread.